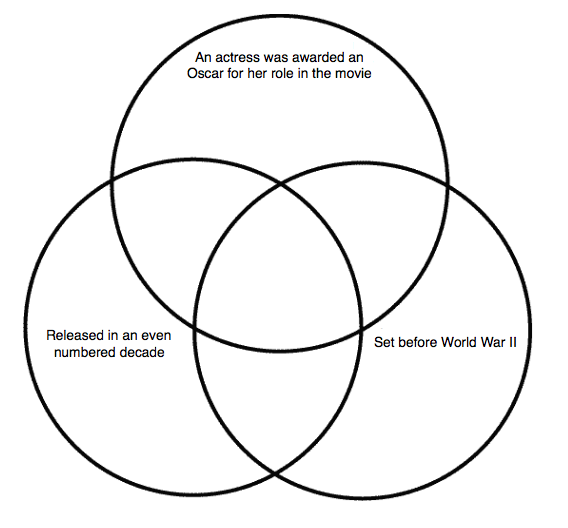 Can you click the most accurate section of the Venn diagram* for each musical? *In this Venn diagram, the three primary category labels apply to the entirety of the three large circles. Intersecting sections depict categories shared by two or three musicals. One musicals does not fit within the diagram, for this musical click outside of it. Examples of even number decades include, 1920, 1940, 1960 e.t.c. To distinguish between movies titled the same which were released in different decades, an actor from the intended movie is also given.